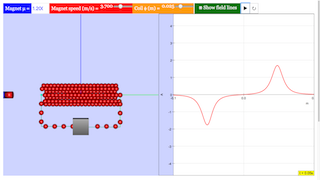 This simulation shows how a magnet passing through a solenoid induces an electrical current. The current is measured by the amperimeter at the right bottom of the frame. Setting the field box will set the strength of the magnet. Toggling this will set the speed of the magnet. Set the size of the coil. Checking this will toggle the visibility of the field lines in the world. The field lines are represented by the orange lines around the magnet. Note that this won't work if the simulation is running.